I ran for Boston yesterday as many of you did too. 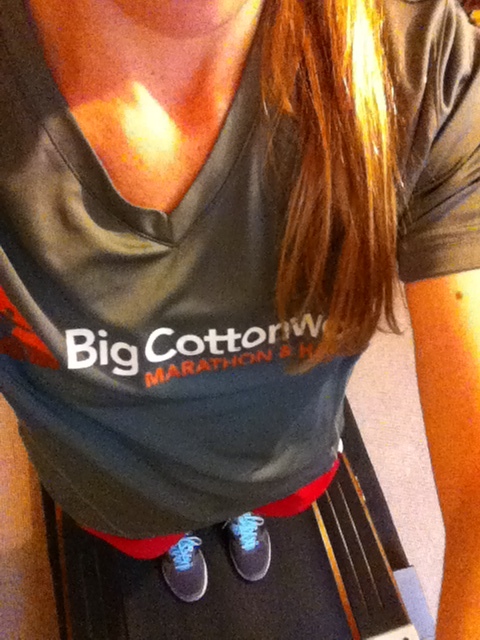 I sported my Big Cottonwood race shirt from last year. Throughout the run I thought a lot about Boston, but most of my thoughts were turned to the wonderful heroes I’ve been hearing about all over the media. It definitely makes me want to volunteer and be involved at races. It’s no surprise that I love my treadmill. I truly am so grateful that I can wear whatever on my run, arm myself with snacks and fun toys for J and get the miles in. However, I do get sick of running on the treadmill(shocking I know). For the upcoming half I’ve done most of my training on the treadmill. I’ve been able to get outside for a bit, but most of the miles were done inside in perfect conditions. Has anyone ever trained for a race on a treadmill? I know this girl ran an entire marathon on one! I run a lot slower on the treadmill. I have to really work to run an 8:30 pace, where as outside that’s my comfortable pace. For me, I feel like running on the treadmill is a great workout because I constantly have to push myself and not let myself just stop(running outside I can’t really stop until I get back home). On the other hand, running on a treadmill is usually in perfect conditions. It doesn’t rain on me, there’s no wind, and I have a lot of entertainment(TV, music, J). At this point in my life, treadmill running is what works for me. When the weather outside is not ideal for J to be subjected to(ahem, or me) I run on the treadmill. It’s just where I’m at in life and I’m okay with it. How do you feel about treadmill running? Do you run faster or slower on the mill? This entry was posted in Uncategorized and tagged advice, Treadmill running, workout. Bookmark the permalink. I wish I had access to a treadmill right now. I really like it and actually think its really beneficial to my training. I do have a hard time keeping my outside pace though. I think it’s beneficial too. I’ve heard some articles criticizing it, but I love it! I love running on the treadmill!! And I trained for the first 5K I ever ran solely on the treadmill! I don’t mind the treadmill when it’s cold out. I much prefer running outside though. I’m like you with not being able to go fast on the treadmill. My pace is about a minute slower on the treadmill than it is when I’m outside. Oh, I actually loathe the treadmill and avoid it at all costs. The only time I resort to the treadmill is if it’s pouring rain or crazy hot! I will run in negative temps and snow before I get on that thing. haha. I am jealous you like it- I wish i did! I hate the treadmill! I’m trying to get used to it because I might have to use it more in FL summers…but it’s just so boring to me! I’m slower on the treadmill too, which is funny because the treadmill is doing half the work for you by moving your feet back without you having to lift them up! PS. I CAN FINALLY COMMENT AGAIN?! Oh no, i’m sorry you hate it, but at least there are more days in FL to run outside than UT. What do you mean comment again? Was it not letting you before?? I know right? I think it’s so weird that I’m slower. I would love to live in FL haha we’re visiting Disney world this summer! I used to be an outside girl too. In high school I’d get so mad if my mom told me to use the treadmill(if it was too dark out or something). I hope to run more outside this summer. I used to only run on the treadmill, i liked it because I could watch TV, always knew my pace, could people watch. one of my New Year’s goals was to focus more on running outside. I have been loving outdoor runs recently now that the weather is mostly decent. But the treadmill will always be an old friend and so convenient for crappy weather! I have recently gotten over my hatred of the treadmill. I don’t own a treadmill or have a gym membership so it takes some work for me to even get to a treadmill but I have started appreciating a bit more lately. I’m sure once I have kids I will be more of a treadmill runner but for now I m outside 99% of the time. yay for more treadmill lovers haha Ya I totally understand where your at in your life and guess what? That’s awesome that you can run outside 99% of the time, fresh air, scenery, your feet hitting the pavement. Truly the best! I could not train purely on a treadmill, would probably die of boredom! haha I do run on the treadmill sometimes to do speedwork and such but I prefer outside. It is nice to switch things up every now and again. I do love the treadmill for speed work so I can make sure I’m running what I’m supposed to be. I definitely prefer working out outdoors, but sometimes treadmill workouts are more convenient. I love that you ran for Boston yesterday. Thanks! I love how convenient treadmill running is when I have a busy schedule. But running outside I think is such a great break! I’d love to have a piece of cardio equipment at my house. No excuse not to hop on, right? I have nothing against the treadmill and definitely prefer it when the weather is blah, but for the most part I prefer running outside. I’m training for an upcoming half too! Yay! How’s your training going so far? I’m excited to follow your training and your race! 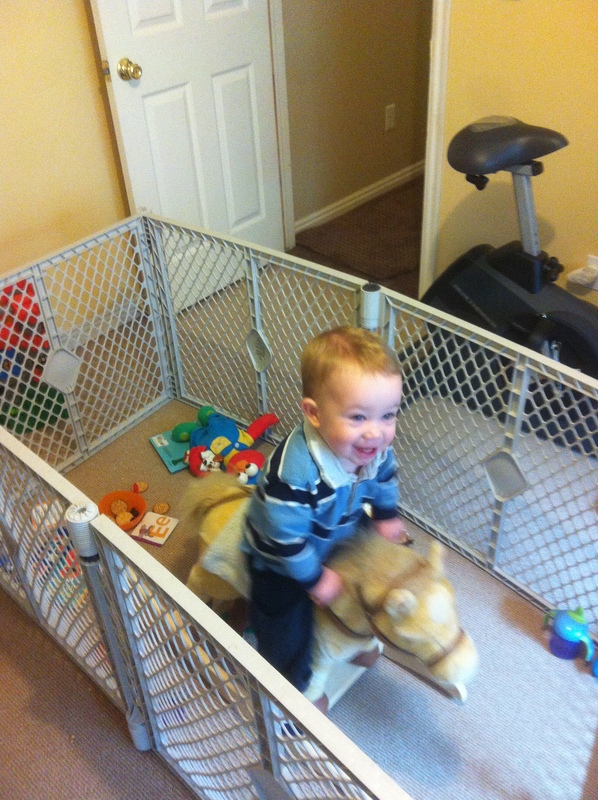 How cute is your little guy on his horsey?!?! Glad you got a good run in! I live in UT(Salt Lake area) are you local?? Well… not really, but yes!! I am in Flagstaff, AZ and my in-laws have a home in Cedar City, UT. Since I’ve only been out here in the Southwest for about a year and a half I am not as familiar with how close or far things are from one another. If you asked me about WI, IL, OH or MI I’d be all over it! Do you travel to AZ often? No I’ve never been to AZ but I have a lot of friends who have recenetly moved there. Yes, Cedar City is near some of the places we visit. It’s so beautiful there! i am a treadmill runner most of the time for kid’s sake. i am ok with it too. but i do have days i just wished it was over. i am hoping next year both kids will have school at the same times and i might get some more outdoor running in:) nothing wrong with a treadmill.